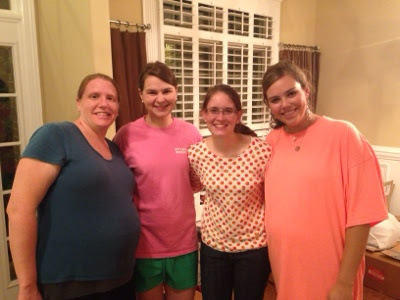 We say all the time that lifegroups "do life" together. We love the precious group of people we get to do life with week in and week out and they have become some of our closest friends. When big things happen in any of our lives, it is all hands on deck to lend a helping hand. Jay and Reagan moved into a new (and bigger) house last weekend. It is good timing considering their little family is growing from 2 to 3 in just a couple months. Friday night we all got together to help them get unloaded into their new home. It was pouring down rain all day and all evening, but that didn't stop them. Granna and Granddaddy graciously offered for P to have a sleepover so we could both stay late and have our hands free to help out. 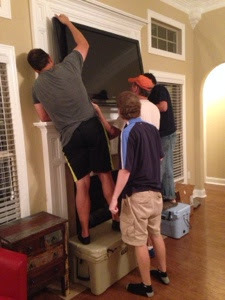 The boys got everything inside the house and then turned to the most important thing to get set up...the TV and electronics. Meanwhile the girls discussed decorating and cleaned bathrooms, cabinets and base boards. Then on Saturday morning Andrew and I got to have breakfast with our friends Ashlyn and Jonathan who we do not get to see near enough of since they live in Florida. It was great to catch up on life with them over some good southern breakfast at Blue Plate. And I totally failed at taking a picture. We were too busy talking and enjoying an adult breakfast since P was still visiting with Granna and Granddaddy. Life is so much better with friends (and family) by your side.